Very pretty, but I somehow wish that we could see the colours. It must have been quite something to look at! I agree – I also wish I could see the colours of this shot because it seems as if her outfit could have been very bright and vibrant. I do like the shot. It’s very interesting – her face looks serious although I imagine she could be about to burst into laughter! Indeed, she must have been! Strong. beautiful! the composition makes it haunting. 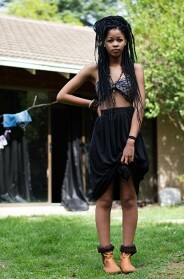 In one fell swoop with your artistic eye you have opened all our’s by posting these beautiful pictures from SA. Bravo sir! Absolutely beautiful! I’ve loved all the shots from SA. Gorgeous! A proud, strong and beautiful woman. What a stunning photograph. Her outfit is so interesting and her eyes, so piercing. Well done! Wow, her eyes! The bandana really suits her too, it brings out the beauty of her face! So stunning. 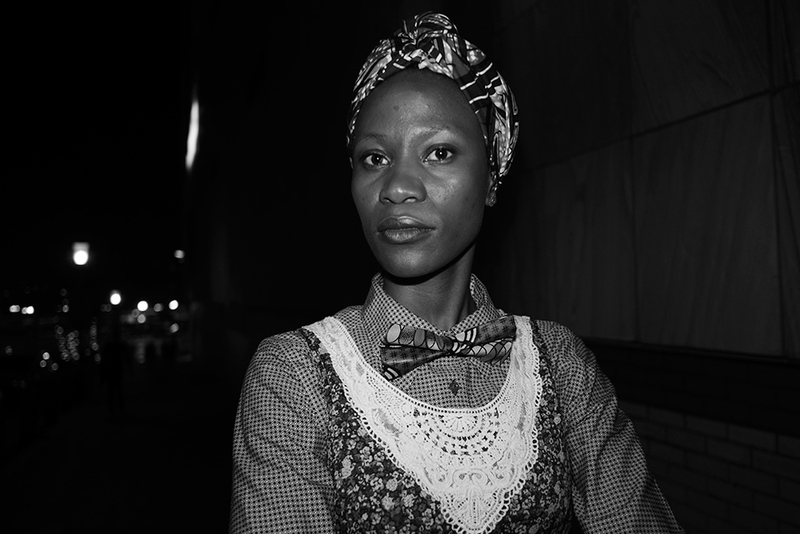 I love the mix of menswear (with the collared shirt and bow-tie) with her feminine dress and headscarf. And she looks so regal while doing this! This is a gorgeous photograph. So strong. ..never expected it to happen and makes a refreshing change! Wow, interesting outfit and a very striking photograph. I agree with Elisa, I wish we could see the colour of this ensemble. I am a fan of the headwrap and in Africa it is not only a fashion accesory its also a big part of many cultures. I’m not one to post my opinion very often, but this image is just oooozing with magic And charm And could be enough to inspire an entire book to be written. This woman… To be able to hear her talk! Now I want to head to my wardrobe And start creating todays outfit. Black and white…very beautiful! I never used to do black and white photography until one day when a friend took a snap of me and guess what it looked like…very unique! I however feel you should include the coloured ones so that we can enjoy the fashion colour blend. hey sooooooo nice especially that bow tie. Very interesting! The blanck and white photo -as always- adds to the texture. Keep safe and warm Scott! Obviously love it! Professional photography at its peak. This is an amazing picture, the expression on her face says a lot. I agree with Elisa, I would love to see the colours in her head scarf. Gorgeous. She looks so calm and proud. I’m sure she’s wearing colourful clothes ! Great photo and outfit, but I would have love to see the color too, as I imagine it is colorful! Beautiful woman. I am not a fan of the ? 80′s Jessica Mc Clintock thrown over the tailored shirt. Points to her for having the cheekiness to do so ! Wow, the reflections in this photo are stunning. Beautiful! I just can not get enough of the SA photos…. So nice pics. She looks great. I’m loving all the patterns as they stand on their own but seeing how well they’re mixed is inspiring. Nice picture! It kinda brings me back to the 1980s. I actually really love the use of black and white here – such nice contrast with all the patterns. It’s wonderful to see photos originating from a city not often featured. The evolution of your work, Scott, has a joy to follow. The style of your subjects changes and your photographic artistry continues to advance. Location has been the one thing that has stayed fairly consistent, however. It would be great to continue to see regular features of less often traveled parts of the world — small towns and strong urban areas in less traveled countries (e.g. Lagos, Nigeria) — all of these have much to contribute and benefit from your eye beyond the oft featured Paris, Florence, Milan and New York. Quite surprised one dares to go out there at night. Jo’burg is so dangerous! STRIKING. She is so STRIKING! LOVE this look and LOVE that you have chosen to showcase it in black and white. The yoke detail, along with the dark background and mysterious lights, prime this composition for black and white photography…her skin luminous, under the moonlight (“the serious moonlight”). Good call (and Bowie line!). I love all the shots from Johannesburg, so beautiful and unique. Such graceful and elegant beauty…. is that a bowtie? i agree, wish we could see the colors. i’m sure they’re bright and perfect. In the face of=the darkness in NY this photo brings some much needed light! She has a great eye. With a few oldish things she has dressed them up and made them magical. Beautiful lace on the bodice front! I love her headscarf. Her eyes are beautiful, lovely photo. I like the serenety that transmits. Stunning black & white picture. The bow tie is perfection to me… but I would like to see this photo in color…must be fabulous colors here. I think there would be a lot of colours in this pic, that’s why I love black and white!! I always love the bright prints of the south african traditional clothing!! That is Awesome! That is Fashion! luffh it, luffh it! I love the B&W when it’s obvious it should be colour – it forces me to think what it must have looked like in person but at the same time I think I appreciate a little more the crazy mixture of patterns going on – that are really fabulous. If the photo were in colour, my imagination would not be as engaged. Bravo, Scott.